This is the G page of our A to Z guide to plants -- how to care for them, landscaping with them, and cooking and healing with them. Surprisingly, a tropical climate is the most difficult environment in which I have ever had a garden. And, I have been gardening since I was a youngster growing up in Rhode Island, a tiny coastal state in New England, the most northeastern part of the United States. As an adult I have had beautiful and very productive gardens in Rhode Island, Washington, D.C., and in Taxco, Mexico. Gardening on the Caribbean island of Montserrat proved to be my greatest challenge. Instead of being the garden of Eden I envisaged when we bought our property, it challenged everything I knew. It seems that every avid gardener arriving to live in Montserrat does so with the same enthusiasm and unbridled hope as I did; here it is sunny and warm year round and there are many months of rain -- what a garden I will have! When we bought our property in Montserrat in the West Indies several years ago, I fell in love with the overgrown garden, the views and the national park that lies behind the property. The house was comfortable and the pool was lovely, but the garden was not exactly as it appeared. In the garden, the first two inches or so of the soil was pure volcanic ash, a fine grained powdery cement-like material. Below that, we found about two inches of rock hard barren generic dirt and rocks and below that we found even harder clay. None of our familiar garden tools were up to the job of dealing with the ground so we turned to the local favorite, a mattock. The mattock redefines what you may think of as a "pick." I can barely lift it and by the time I've carried it to the garden I am exhausted and there the tool lies till tomorrow. With my over-riding gardening optimism and my husband's desire to make me happy, we dug out a fifteen by fifteen foot garden the first year and I began to enhance the soil -- making good dirt is one of my passions. We were in Montserrat hard at work for several years. Often when local farmers come by to see our gardens we would hear comments like, "Look at that fat soil." Fat soil is prized in Montserrat as the best place to grow vegetables. Listening to local farmers and asking many questions we have learned that planting by the moon is a Montserratian traditional practice. The sweetness (alkalinity) or acidity of your soil will affect the health and productivity of your garden plants. A pH on the sweet side is normally considered beneficial for most vegetables. Gardeners routinely apply agricultural lime to sweeten the soil before planting. In Montserrat there was no lime available so farmers used wood ashes or nothing at all. This had a decided impact on the quality and quantity of vegetables that were produced there. The pH scale runs from 0 to 14 with 7 being just about neutral. Numbers above 7 are alkaline and below 7 are acid. If you are in a similar situation with no access to lime, use the ashes from firewood. Spread them as thickly as you can on the garden area and mix them into the soil. Then water it well and do so for three days or so before planting. One of the most important things I finally learned is that the most successful vegetable gardens in the Caribbean are planted to be harvested in the winter. In the Caribbean, summer is a time for letting the garden rest -- with very few exceptions. Mung beans and yellow/orange sweet potatoes do well, as does okra (ick). Mexican hot peppers of all kinds do well too. I'd love to hear if you have had real success planting other crops in the hot summer, tips I can pass along to other gardeners like us. If you live in a tropical environment that has an extended dry season or uneven amounts of rainfall, you will most likely be forced to drag out the hoses. I found it best to water only during the very early morning in areas receiving morning sun. I was then able to move the hoses to areas receiving afternoon sun and finally to areas of bright shade. Watering plants in direct sunlight simply burns them so get off to an early start to your day. This the most wonderful flowering bush I've ever met. 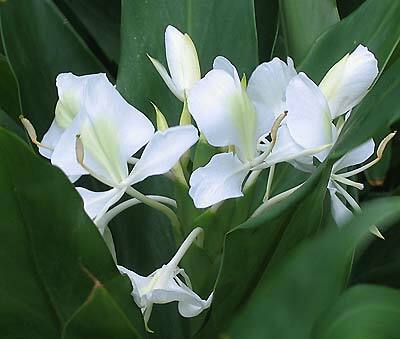 It has deep green 2 to 3" shiny leaves and bright creamy white flowers that smell like heaven. I've had them as house plants in Boston, Massachusetts, Providence, Rhode Island, Washington, D.C., and outside in gardens in Oaxaca and Taxco, Mexico. This year I even had one planted in the garden at our home in Guatemala. 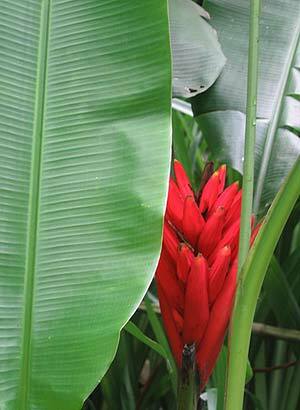 Photographed: In the Botanical Garden at Hotel Atitlan on Lake Atitlan in Guatemala. Planting and Care: This variety prefers a neutral to acid soil and light shade when planted outside. As houseplants they'll do well in a sunny window with regular misting. They do not like dry air. 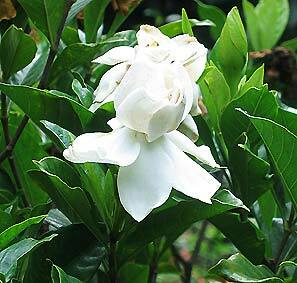 See also Crape Jasmine on the "C" Page for what is called a gardenia in Montserrat. Garlic has been widely promoted for years as THE food that will cure whatever ails you. It was perhaps the first "super food" to be taken on by advertising and public relations firms hired by agriculture companies growing garlic. The industry was centered in the US so that is where their money paid off when garlic gained wide popularity. Many people believed the 'hype' and are now eating it in impressive quantities. Please remember that the smell of garlic in food is not so aromatic in sweat. If you will be flying on a commercial flight especially outside of the US, be courteous and cut down on your garlic consumption three days before your flight. Benefits: As I've said above, if you have any ailment, even cancer, garlic is said to cure it. And, if you believe that, I have a bridge to sell you too. Many years ago I read that garlic would rid dogs of intestinal parasites which sounded great. I asked the veterinarian who took care of my two Irish Setters what he thought. His response was very simple. If you can get them to eat a bushel of garlic each in one day, it may work. Enough said for that "cure." Buy a nice looking head of garlic and let it age naturally on the shelf outside of the sun until it begins to sprout. Break apart the head into its cloves and fill an 8" wide 6" deep pot with good soil. Push the individual cloves into the soil until only the head remains visible. Water and place in the sun. With regular sun and water you’ll not only have lovely plants, you’ll have leaves that you can add to salads and eventually new heads of garlic. This method worked fine when I was planting in pots, but when I turned to planting in the garden I had very disappointing results. This is an alternate planting method I found. Take a fresh head of garlic and break it apart into cloves. Soak them for two hours in water with a heaping tablespoon of bicarbonate of soda which is said to neutralize fungus. Drain the water and remove the skins. Next soak the cloves in alcohol a few minutes and plant them immediately about 3" deep in soil. Benefits: The onion like leaves are edible and the autumn blossoms are very pretty. Planting and Care: This perennial plant will do well in full sun or in a sunny place with some shade. Give it an average amount of rainfall or watering for your area. From tuberous roots, the thin strap shaped leaves of wild garlic will grow to be about twenty inches tall while the flower stalk will grow to be just a bit taller than the leaves. 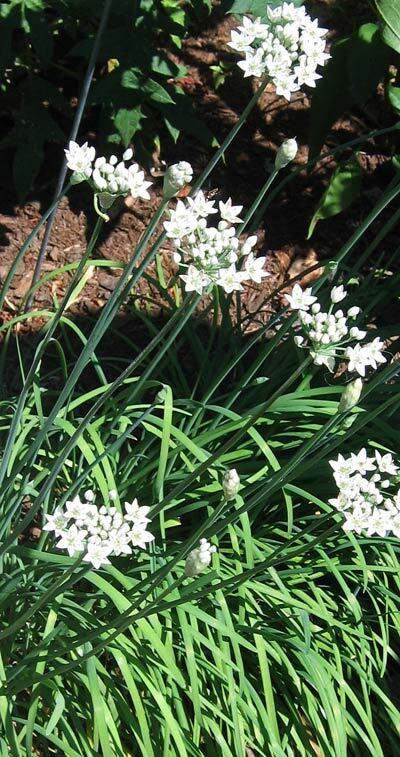 Benefits: Aside from its edible leaves and flowers, it is believed that its strong smell of garlic when the plant is brushed or when the leaves are crushed and used as a rub will repel insects such as fleas and mosquitoes. 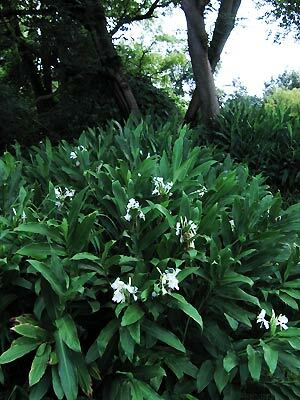 In Africa, wild garlic is believed to have all of the beneficial qualities for human health that regular garlic is known for throughout the world. It is even believed to be a snake repellent and said to be planted around Zulu homes for that reason. Planting and Growth: Wild garlic grows quickly and is ideal for enlivening the sunny, hot, dry, difficult areas in a tropical garden. They will grow and bloom, but if you can give them a bit of extra water they will really shine. 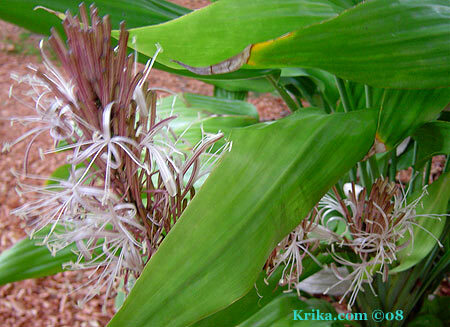 The pink to lilac flower heads will bloom for almost four months. Ideally wild garlic will thrive in a well composted and moist soil in a sunny or semi shady area of your garden. Lovely perennial gaura will grow to be from 2 to 4 feet tall depending on the variety you plant. It has long leggy stems which may be even more attractive given some support. For some ideas click here. Expect a good flowering from August through September. 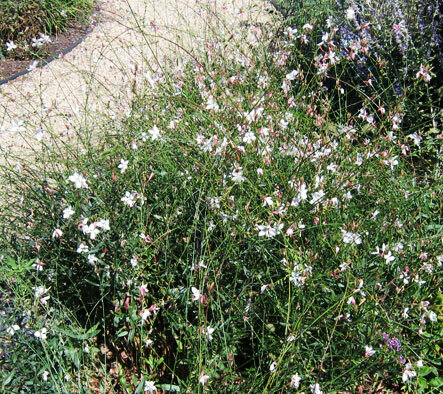 Benefits: Gaura will attract bees, butterflies and hummingbirds. 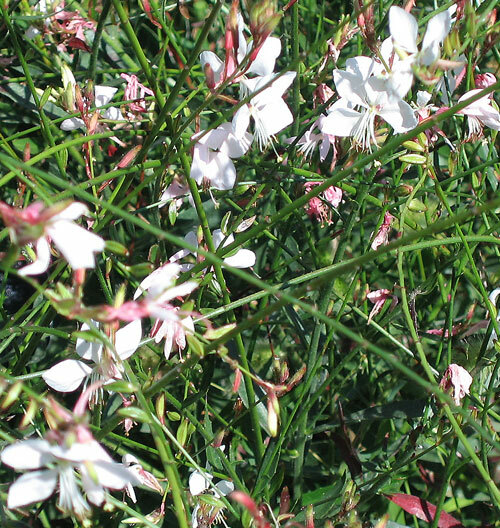 Planting and Care: Gaura likes full sun and a good quality well drained soil. It is drought tolerant and easy to grow, but will probably appreciate having some support to lean on. Maybe best would be planting it above a low retaining wall where it will drape its lovely blossoms. http://www.kwiaht.org/kwiaht.htm "Kwiáht is a nonprofit conservation biology laboratory in and for the San Juan Islands of Washington State." **Gazania, Treasure Flower Gazania rigens "Christopher Lloyd"
This is a low growing perennial bearing its colorful flowers almost continuously in a warm climate and spring into fall in a cooler one. They make great border plantings since they are less than a foot high. 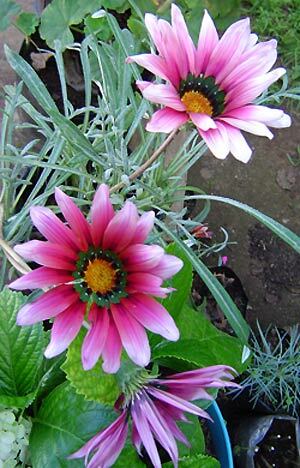 Benefits: Gazania may be planted and grow successfully in areas of drought. Photographed: In the garden of our apartment in Oaxaca, Mexico in 2010. 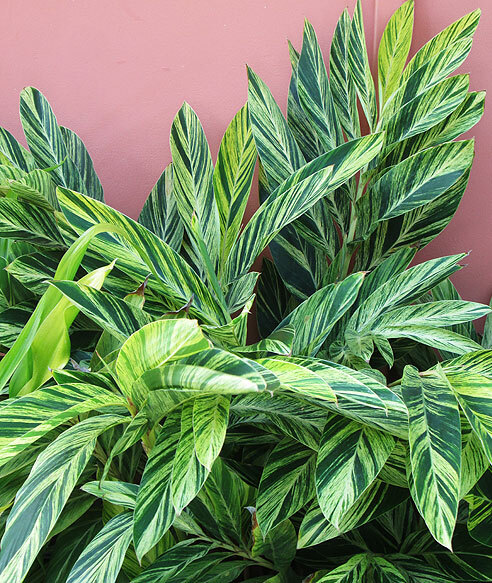 Planting and care: These plants like to grow in well drained soil in full sun in a warm climate if possible though they will survive a touch of 32° F for a short period. 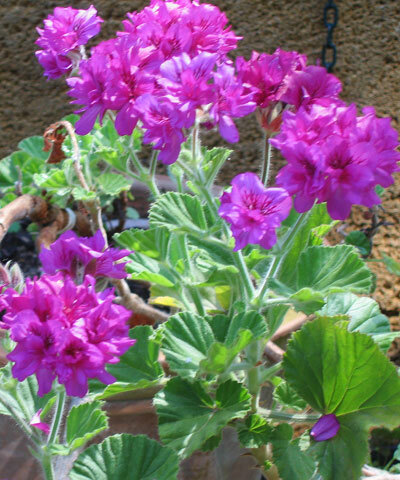 A geranium always seemed the preferred plant of people who had no interest in plants or in gardening. 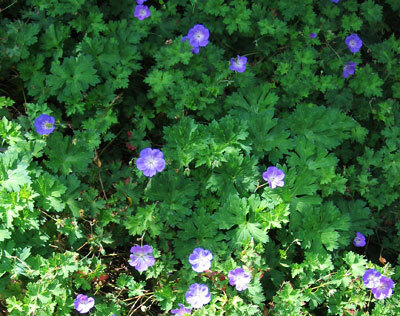 The geranium performed the function of having a colorful flowering green bush at the front door during summer. In the fall, a planter of chrysanthemums fulfilled the same function. In the northeastern United States, the chrysanthemums were followed by a big pumpkin. 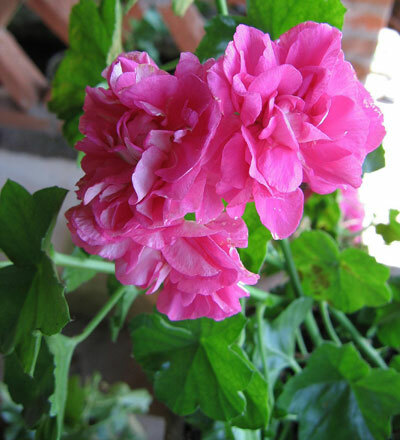 Having lived in Mexico and recently traveled in Greece, I gained a new respect for geraniums. I had some growing nicely a couple of years ago until we began having routine acid rain and then ashing from the Soufriere volcano in Montserrat. 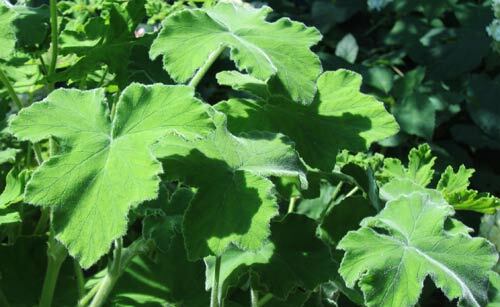 Plants with shiny tough leaves handle ash and acid rain rather well; plants with hairy leaves like geraniums and tomatoes suffer greatly or die right away when exposed. 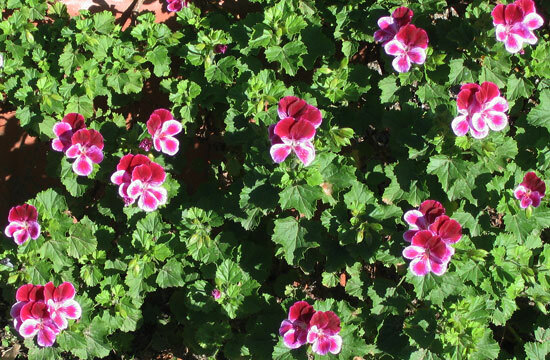 Benefits: Geraniums have been said to "lower stress levels, reduce inflammation, relieve pain, improve kidney health, strengthen the immune system, and ease digestion." 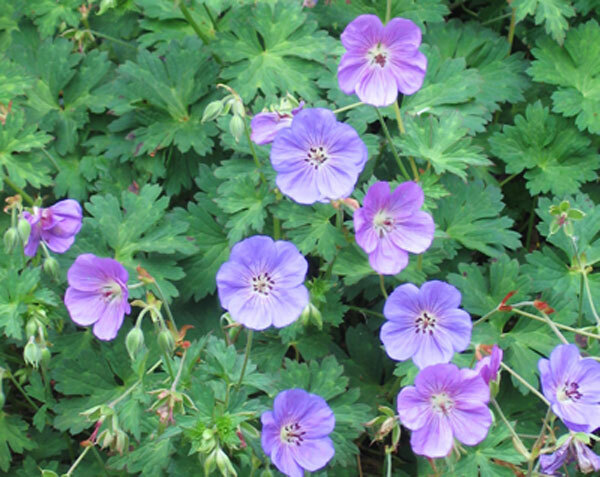 Geranium oil is now used in treating skin ailments as well as in aroma therapy. 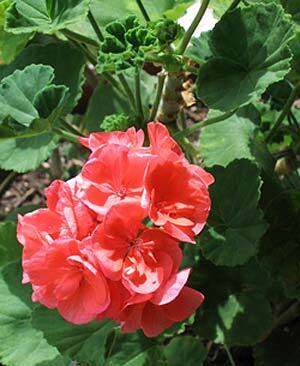 From: Geraniums are members of a very large family with members originating from all over the world. Planting and Care: These can be strong and tough plants to grow where not much else will thrive. They have lovely blossoms and and velvety medium green leaves. 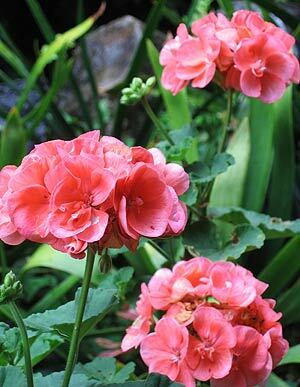 Give geraniums lots of sun and don't let them get too dry and you'll be thrilled with their appearance and their ease of care. 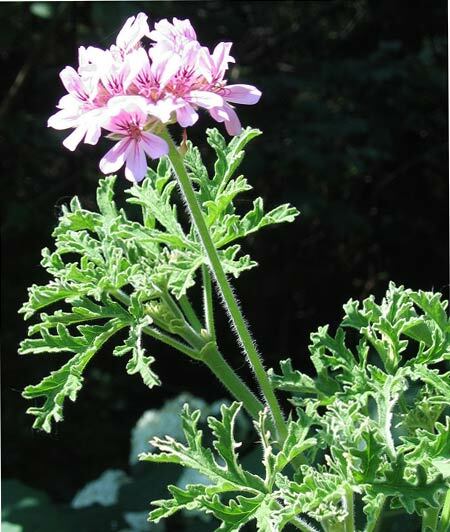 Benefits: Geranium oil is widely used in aroma therapy and they were used in South Africa in traditional medicine for healing cold sores, sore throats and infections. Planting and Care: Find a spot in the garden that receives bright morning sunlight and that's where your French geranium will be at home. Make sure it receives regular watering or rainfall to ensure its bright blossoms. Try not to wet the leaves if you are watering as you risk leaf rot. Photographed: At the entrance to the Hotel Atitlan on Lake Atitlan in Guatemala in May of 2010. 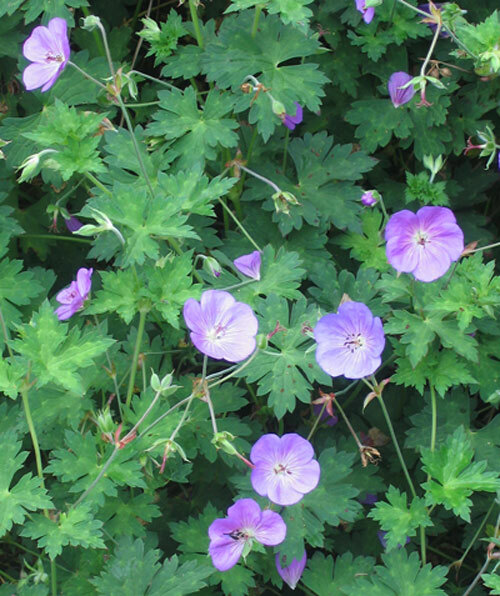 Planting and Care: Differing from its upright cousins, the hanging geranium has smoother shiny leaves as you can see in the photograph below. Like its cousins, this tough flowering plant prefers neutral soil, full sun and relatively dry conditions to be at its happiest. Photographed: In the Hotel Atitlan on Lake Atitlan in Guatemala in June of 2010. 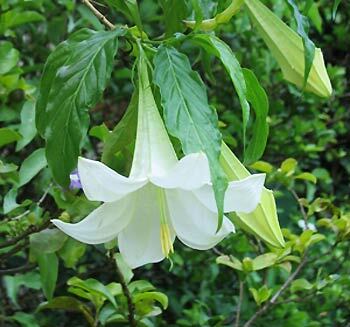 Benefits: This vine's pretty yellow flowers are butterfly and hummingbird attractants. Photographed: On a wall by the side of the road in the town of Panajachel on Lake Atitlan in Guatemala in May of 2010. 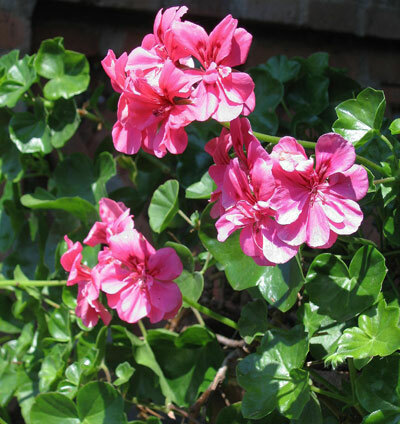 Planting and Care: This pretty and quick growing vine will be happy in full sun or semi shade with a reasonable amount of water. 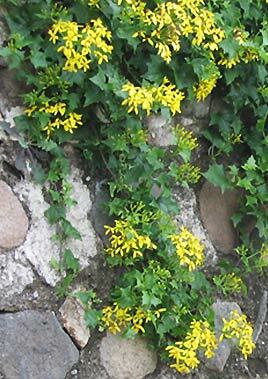 Plant it either as a ground cover or to grace a low stone wall. 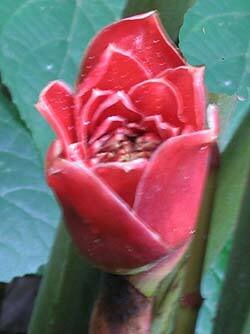 This is an attractive rarely-flowering type of ginger that grows to be about three feet tall. 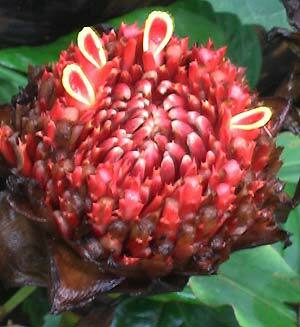 When it does flower, they look much like the flowers on a shell ginger. Its leaves are very fragrant when softly brushed. Benefits: Its health benefits include controlling hypertension as well as acting as a diuretic. 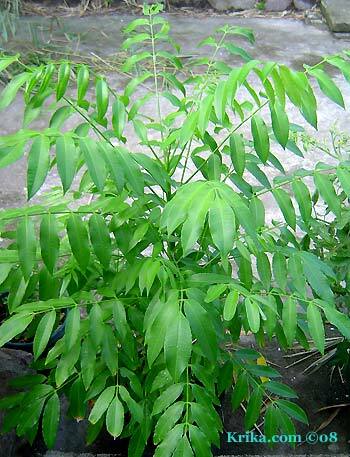 It is also used as an antifungal and antiulcer treatment. When brushed its foliage will give off the scent of cardamon. Planting and Care: Growing to a height of about 4 feet this ginger can provide undergrowth to taller vegetation in a tropical environment. It seems to prefer a semi shady place in the garden with rich moist soil especially in the growing season. It will normally bloom in springtime and just afterwards will appreciate being fertilized. In the cooler months of winter keep it a little drier than in summer. 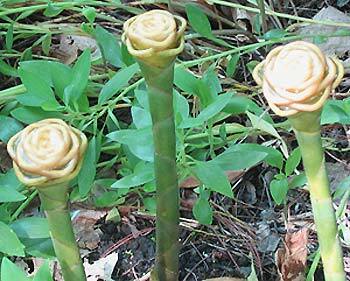 This ginger grows two to three feet tall in a beautiful plant that looks much like a dwarf bamboo. It likes a lot of water and partial shade. Ginger is related to tumeric, another great spice from India. 1. Drinking ginger tea may help with indigestion and tossing a bit into beans is said to reduce gas. Nausea and morning sickness may also respond well to a ginger tea. I haven't found ginger helpful in digestion, but my husband swears by it using the recipe for ginger tea below. 2. I accidentally also discovered ginger's beneficial effect on high blood pressure. When my pressure seems especially high, I have about 1/2 cup of ginger tea and within 10 minutes my pressure will have dropped 10 or more points. It seems a very nice solution if you have spiking blood pressure like me. When traveling I bring along a spice jar of powdered ginger and use a few shakes in a half glass of water. It works well too, but is a little bitter. Do talk to your physician before giving it a try just to be sure you won't have any adverse effects. 3. Ginger may also have beneficial antioxidant and anti-inflamatory qualities. 4. It is said that ginger may also have a beneficial effect in preventing or delaying cancer of the colon. It would be very interesting to know if cultures that rely on daily use of ginger have significantly lower rates of this type of cancer. Planting and Growth: Soak a perfect root overnight and plant just under the soil with the buds facing up in a wind free and lightly shaded spot in your garden and water regularly. Ginger is a heavy feeder which quickly uses up the soil, so plan on using fertilizer or a rich organic soil for best results. Harvesting: At any time feel free to cut stalks and use the stems. When the leaves begin to die back after nine or ten months it is ready for harvesting. Dig out the roots and after washing them well, dry them for two to three weeks. Root crops should not be planted for two years where ginger has grown. Peel and thinly slice a large thumb sized piece of ginger root. Place in a two quart pan with one quart of water and 1/2 cup of sugar. Heat covered and keep at a slow simmer for about one half hour. This will produce a light ginger syrup which should be refrigerated. Use the syrup to make cold ginger drinks in a fifty/fifty mix using either purified water or carbonated water to make a ginger soda. The syrup will last about four days in a cold refrigerator. We found this plant in an area of our Montserrat property that had long ago gone back to being a truly untamed tropical garden. The kahili looked much like a spathiphyllum plant I'd had years ago so I transplanted it to see what it would do. Not much was the answer for a few years and then suddenly it flowered with very muted colors and very unflower like flowers that did in the end have a strange appeal. 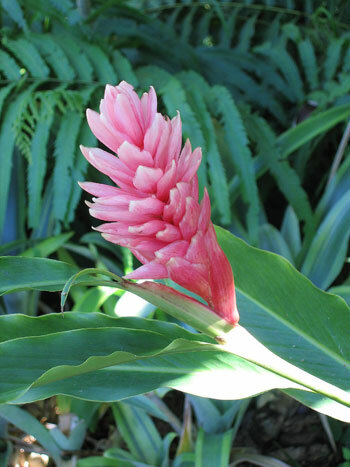 Benefits: Kahili ginger may be beneficial in the treatment of cancer. 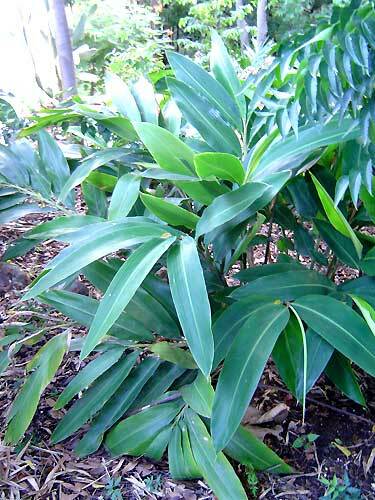 Planting and Care: This type of ginger like so many of the others seems to prefer a semi shady area with bright light and routine rainfall or watering. It should be planted where its foliage will be the highlight rather than its infrequent and unusual flowers. This is one of the more other worldly types of ginger. It could easily star in someone's sci-fi movie. The three young flowers to the right were on stalks about one foot high emerging from a plant with leaves about six to seven feet tall and very scruffy looking. Benefits: This ginger is used in Malay traditional medicine to treat various types of ailments from inflammation to worm infestations. In Hawaii ingredients in the pine cone flower are used in shampoos. From: India, Malay Peninsula, Indonesia and Sumatra. Photographed: At the Hotel Atitlan on Lake Atitlan in Guatemala unless otherwise noted. 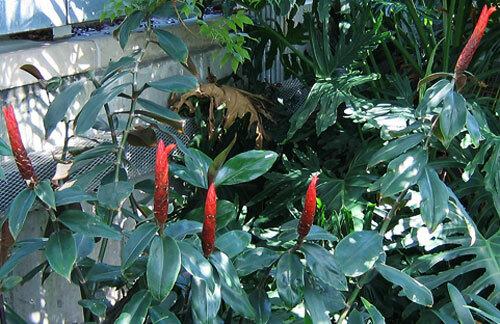 Planting and Care: If you live in a warm climate growing ginger is pretty straight forward. Take a purchased plant and set it out in the garden in dappled sunlight in heavily composted soil. Keep the soil moist, but not continuously wet. Sit back and enjoy the show. 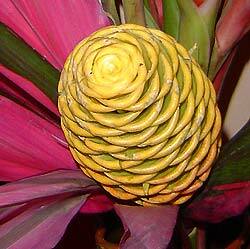 Photographed: As part of a floral arrangement in Panajachel, Guatemala. 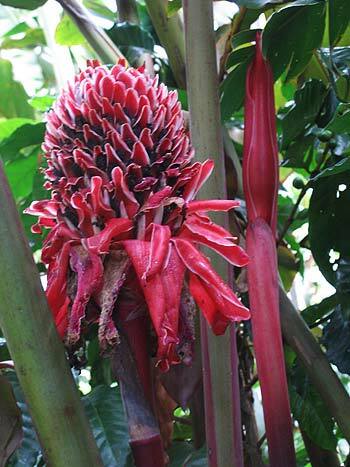 This is an exquisite member of the ginger family along with its identical twin the red ginger you may see below and what's best is they bloom most of the year. We lost ours to Montserrat's devastating volcanic eruption in July of 2003. 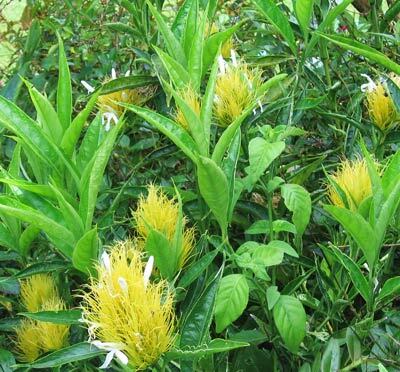 Benefits: It is widely used medicinally to treat skin sores and stomach problems. As an added benefit it is attractive to bees, butterflies and hummingbirds. Photographed: At the Hotel Atitlan botanical garden on Lake Atitlan in Guatemala. 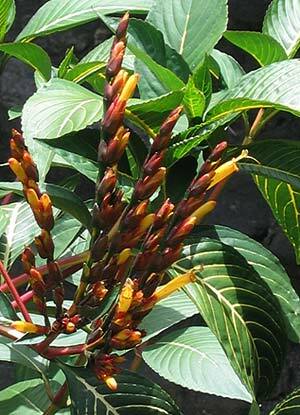 Planting and Care: As are most gingers, this is a perennial growing up to 12 feet tall. Plant this beauty in bright shade in moist rich composted soil. It will also appreciate a monthly dose of a high nitrogen fertilizer. 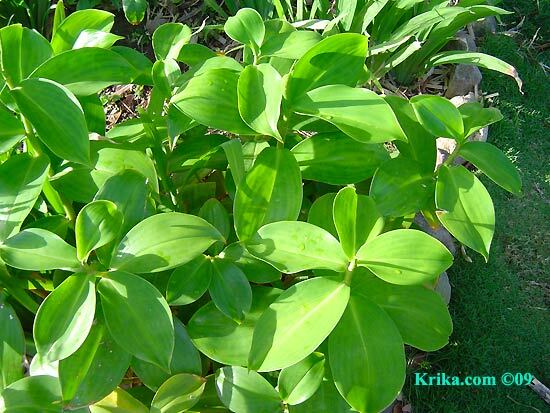 This is a lovely easy to grow plant in the ginger family. It has bright red knobby sorts of flowers, almost like tight small pinecones. Benefits: Red Button ginger appears to have significant medicinal benefits. It has been used to treat high blood pressure, bladder problem, ear infections and even fever and coughs. Planting and Care: This is a perennial which will grow to be from 3 to 6 feet tall. Red Button flowers around the year and does best in sun or in a semi shady area with routine rainfall or watering though it will tolerate some dry periods. It doesn't seem at all difficult to grow or even to thrive and it makes an attractive and distinctive backdrop for other plants. I planted mine where it would receive almost full sun, but not wanting to risk sunburn I'd recommend a place in the garden with morning or late afternoon sun. 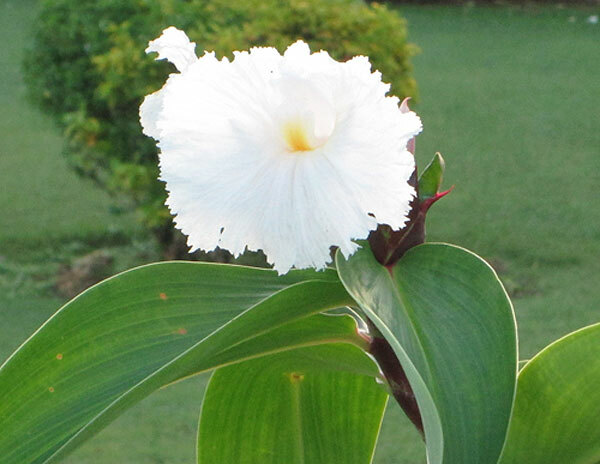 Benefits: The Alpinia purpurata is said to have many and diverse health benefits. 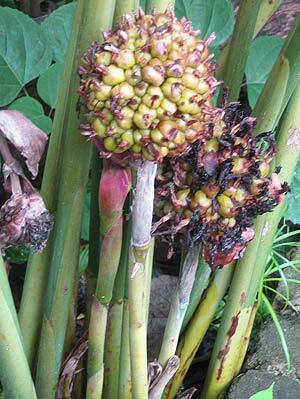 Planting and Care: Like many varieties of ginger, it likes a moist soil with lots of humidity. It will do best in a bright shady area of the garden. It is not tolerant of freezing conditions. This large variety of ginger will grow to about nine feet when planted in rich loamy soil in its preferred partial shade and given adequate water. 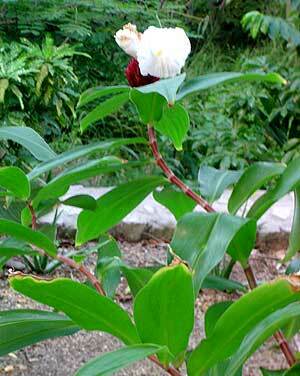 It is a tough plant; ours in Montserrat survived a drought with no watering as we were away for several months. Its sturdiness is wonderful, but its flowers are the real reason to have it in your garden. They are lovely! Benefits: Shell ginger is believed to have many and varied medicinal uses ranging from fever reduction to reducing muscle spasms, intestinal gas, and swelling. Always check with your physician before using an herbal medicine as many can have adverse effects. Photographed: To the left at the Hotel Atitlan at Lake Atitlan in Guatemala. Below on the left in our shady terrace garden at our former home in Montserrat and on the right at the Hotel Magdelena in Tobago in 2018. 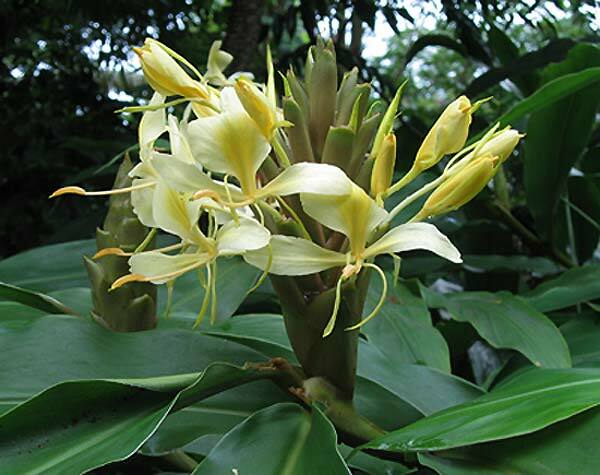 Planting and care: Shell ginger loves water and will do well in a sunny to semi shady setting flowering usually in the spring. It should be fertilized about twice a year. 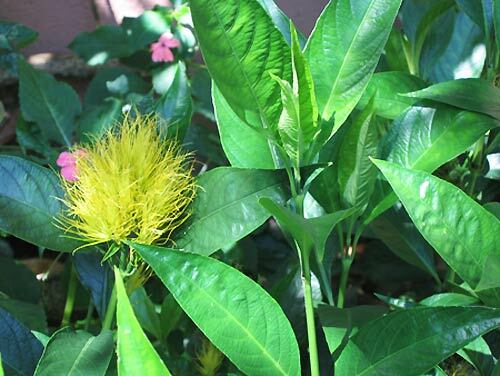 This is a very lovely plant with beautiful flowers and it lived happily in our shaded terrace garden in Montserrat. Then one year we returned from our travels and it was gone, but now growing across the street in our neighbors garden. 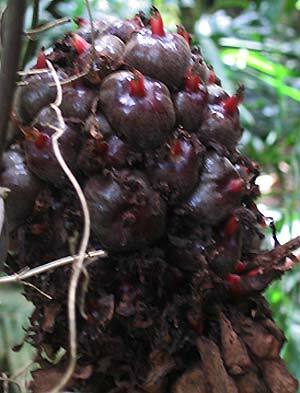 Benefits: As with other ginger family plants, spiral ginger has a wide range of health benefits. Photographed: Below on the left In our shady terrace garden at our former home in Montserrat and on the right in Crown Point, Tobago, in 2017. 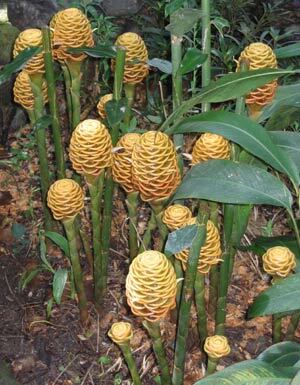 Planting and Care: This lovely spiral stemmed ginger well situated will grow to about six feet tall and will have lots of lovely flowers and the foliage all by itself is very attractive. It will grow best in a bright semi shady area with routine rainfall or watering. If you happen to live in Montserrat, guard it carefully as these 'good' Christians steal with abandon. This is one of the creepier gingers which in almost all phases of flowering appears to be a plant from outer space, something dropped here on earth by accident or with a sinister plan. Of course this makes me want one for our garden as soon as I can get seeds or a seedling. 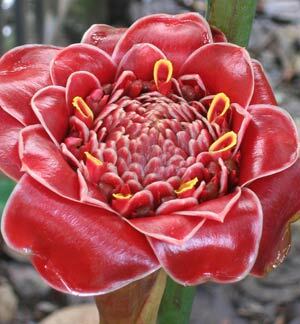 Benefits: Aside from being used in food preparations in several countries, torch ginger is said also to be of great benefit in healing. Planting and Growth: While the leaves will shoot up to 14 feet, the flower stalks will be only 3 or 4 feet tall. They emerge first looking almost like a thin tulip on the top of a tall stem and then the real flower flows forth. 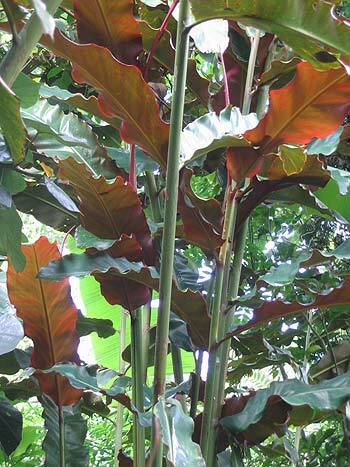 The plant is said to prefer full sun or bright light, but all of the photographs here were taken in relatively deep shade though the tops of the tall leaf shoots were all in bright sun. The plants do seem to require lots of moisture and like almost all plants in the ginger family they do not like to be in a windy situation. 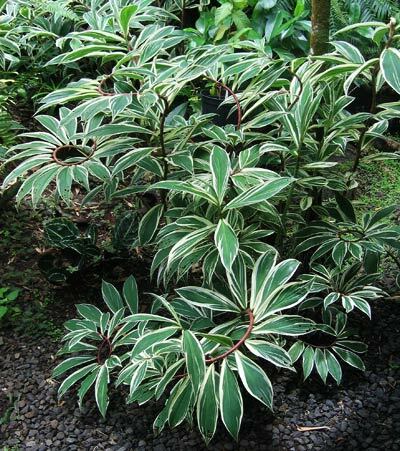 As with almost all variegated foliage plants, variegated ginger adds a bit of pizzazz to a shady garden. Benefits: This is not an edible form of ginger. 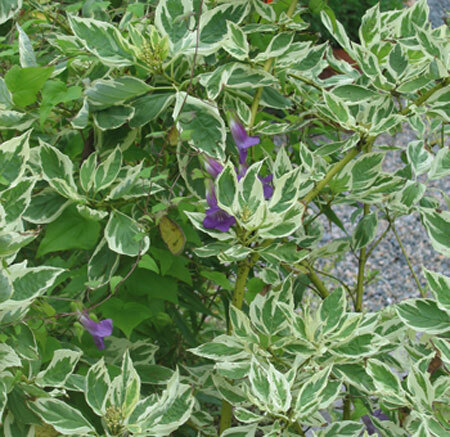 This is a plant I would have for its foliage as its white flowers are relatively small. 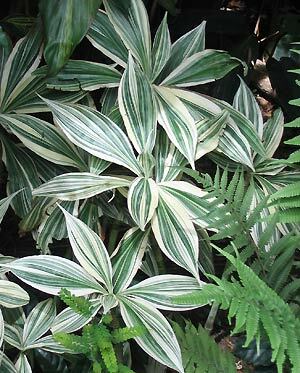 It will certainly do a good job of dressing up a shady area of your tropical garden. 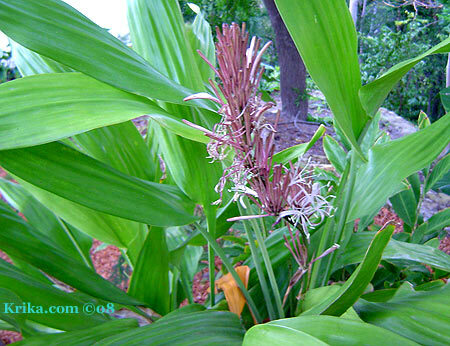 Benefits: This small ginger plant has many health benefits and, as well, it is used in cooking. 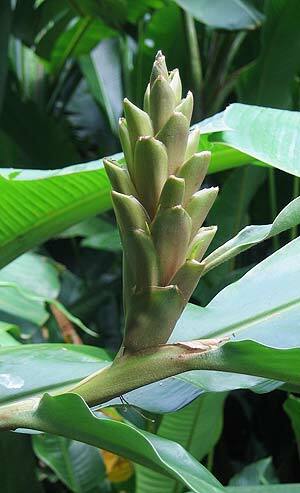 Planting and Care: This ginger is smaller than many others, growing to be only about 3 feet in height. 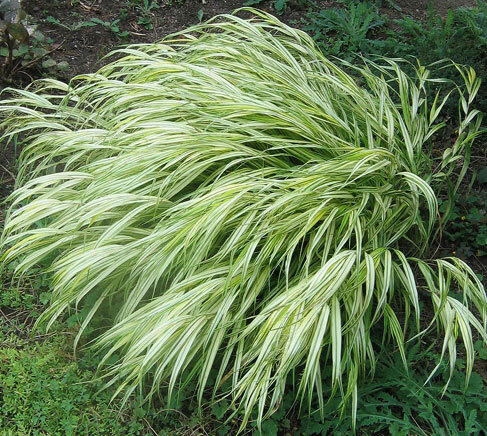 It prefers a bright shady area of the garden, but can handle some direct sun. They like to be well watered, but not drenched, and of course a humid environment makes them pretty happy. 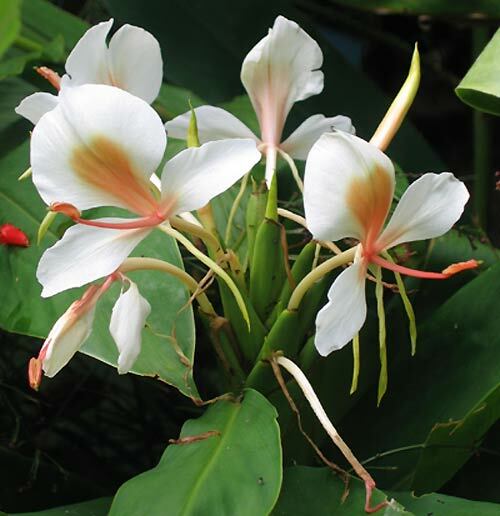 Benefits: Hedychium is one of the plants used in Chinese medicine. From: In the western part of the eastern Himalayas region of India all the way to southern China and Taiwan. Planting and Care: Like most gingers this beautiful perennial likes to be in semi shade though it seems tolerant of more or less light. It is also most content with a highly composted moist soil. Given the right conditions it will grow to be about 6 feet tall. 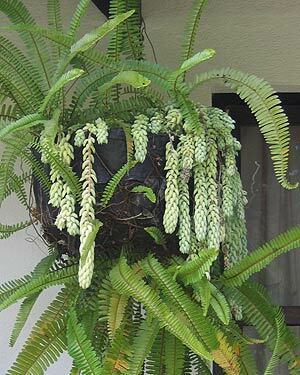 Photographed: In the Hotel Atitlan Botanical Garden on Lake Atitlan in Guatemala. Planting and Care: A bright shady place in the garden seems almost essential since this ginger will dry out and suffer terribly in the sun. A rich moist soil along with the shade should do the trick and you will have lovely flowers like these. Benefits: This ginger is used in various ways in Chinese medicine. Ginkgo Tree, Maidenhair Tree Ginkgo biloba L.
Ginkgo trees are lovely in the fall when all the leaves turn a golden yellow. Sadly the smell of the trees at this time of year is also pretty terrible. Benefits: The seeds of this tree are edible and are often used in Japanese cooking and it is also believed to have health benefits. 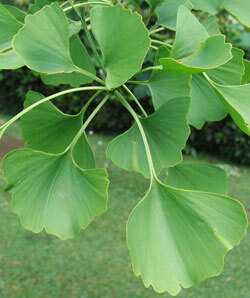 From: The ginkgo is native to China. 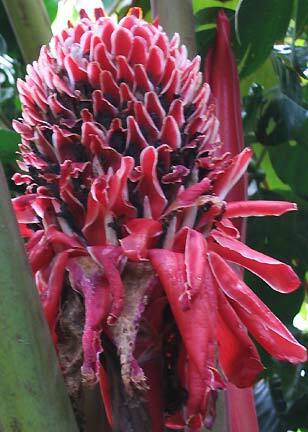 Photographed: In the Ortobotanico in Naples, Italy. 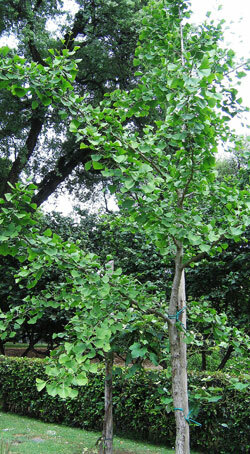 Planting and Care: Ginkgos like to have some hours of full sun every day, but it will do well with the rest of its day in partial shade. It is very tolerant of soil types and city born pollution. This relatively small plant, about 15 inches tall and wide adds a bit of color to the garden bed if you have a lot of greenery. 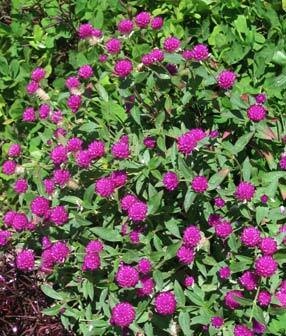 Planting and Care: This bright little annual plant is as useful in the garden for color as it is easy to care for. Though it prefers a sunny spot and routine rainfall or watering, it is adaptable and will tolerate some shade and hot, dry periods pretty well. I don't particularly like the purple variety of this plant, but when I saw this orange/red blossom in a wildflower setting it seemed perfect. It will grow to be about 2 feet in height and it will flower abundantly during the summer season. Benefits: This flowering plant has a medicinal value in cultures as diverse as those in Hawaii, Trinidad and Tobago and Nepal. It is also known to be a butterfly attractant. Planting and Care: Plant this little beauty in full sun in more northerly summers. In the hot Caribbean, I have found many plants do better protected from mid day sun. Make sure it receives rainfall or is watered regularly. 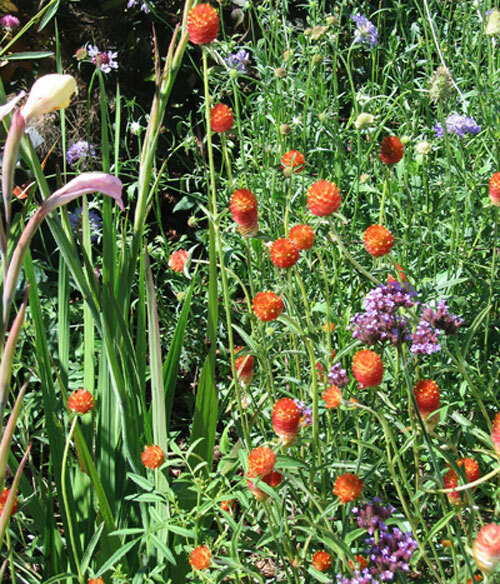 It is somewhat drought tolerant, but it will not survive being in continuously wet soil. It is a perennial in warm climates and annual in the north. 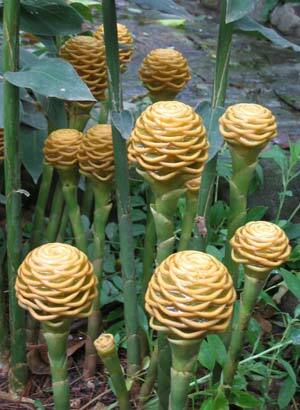 These are intriguing flowering plants that may grow on you as they have me. 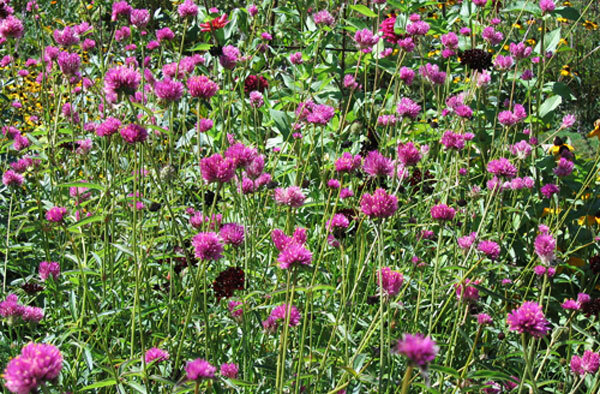 Plant them where you might enjoy seeing them the next year as they are perennials. The will grow to be just under 2 feet in height. 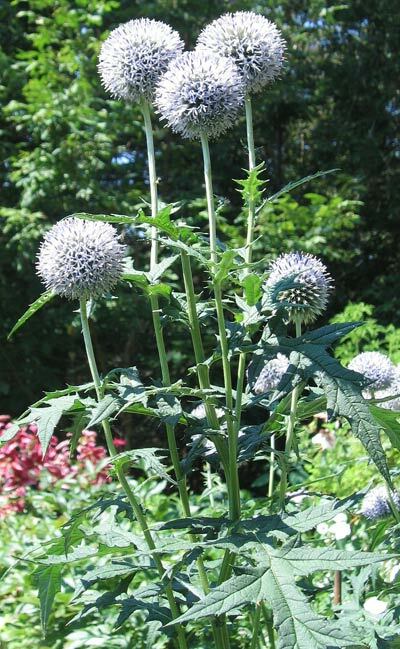 Benefits: Globe thistle is said to be an anti-inflamatory and has been widely used in the treatment of breast disorders. 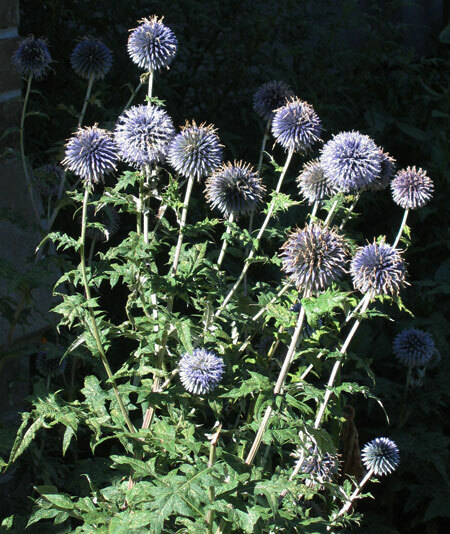 Planting and Care: Plant the globe thistle in full sun in an area of your garden that has the poorest soil. It likes routine rainfall or watering and an acid soil if possible. Photographed: In the Thuya Garden on Mt. Desert Island, Maine, in 2013. This is a charming small tree that I plan to have in my garden as soon as possible. The flowers are glorious as are the buds as you can see in the photographs. I honestly can't remember if it has a lovely scent, but wouldn't that be perfection! Planting and care: This wonderful small tree likes to grow in full sun where it will receive routine deep rainfall or watering. It is salt tolerant which makes it perfect in a Caribbean environment. 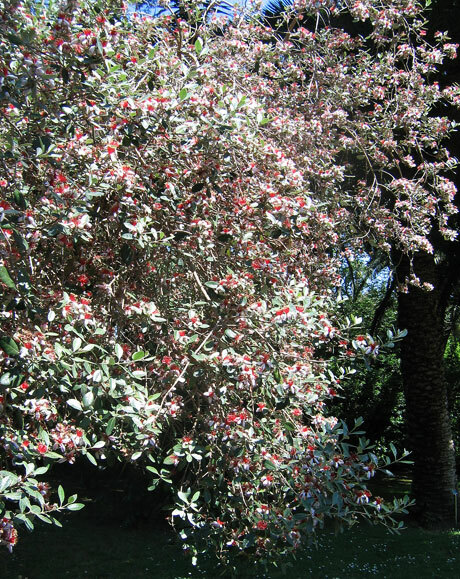 This is an easy to care for long blooming informal bush growing to perhaps 10 feet or so. While it doesn't seem to wow you at first, it does grow on you over time. 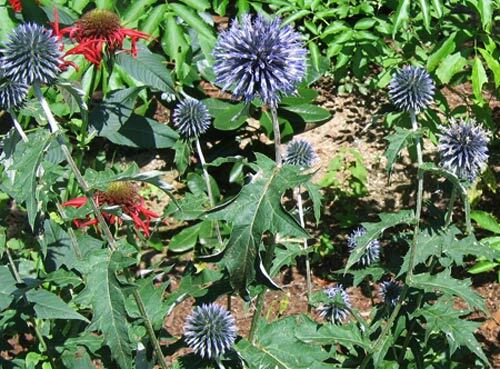 Benefits: It is a butterfly attractant and in Brazil it is used to treat stomach problems. Photographed: May 2010 at the Hotel San Buenaventura at Lake Atitlan in Guatemala. 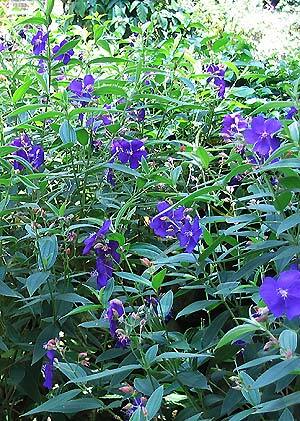 Planting and Care: Plant your glory bush in full sun in rich composted soil. It does not like to sit in wet soil, but it does like to receive routine rainfall or watering before its soil dries out. Goat horn is a meddlesome tree that resists elimination; cut it back and it simply grows again. It has sharp thorns and seems to find ideal growing conditions right within the root base of some of your favorite plants and trees. Its only saving grace apparently is that once mature it can be used in making charcoal. The golden apple belongs in the citrus family. Its fruit is highly prized by those that know it. We received and planted a seedling and thought it would be a few years before we would know if it would become one of our favorites. It got off to a good start, but sadly we sold our home before we grew to know it well. Benefits: Sweet and tangy fruits that may be as large as a grapefruit. They are said to have a lovely smell. It is also said to many curative qualities, but be very careful with it because it is known to cause liver damage. Photographed: On the left below just under our shady terrace garden at our former home in Montserrat and on the right in Bon Accord, Tobago, in 2018. Planting and Care: This is a tree of modest size slowly growing to be about 50 feet in height. Once planted in full sun, it is uncomplaining about the type of soil it lives in or its pH. It likes soil that is moist either by rainfall or by watering. It does not grow well in windy conditions. Golden Ear Drop, Pigeon Berry, Skyflower (1) Duranta erecta Linn. 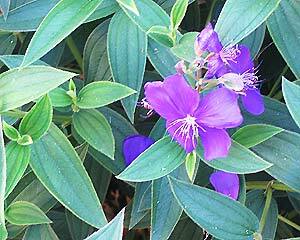 With its beautiful purple flower this plant is inaptly named. 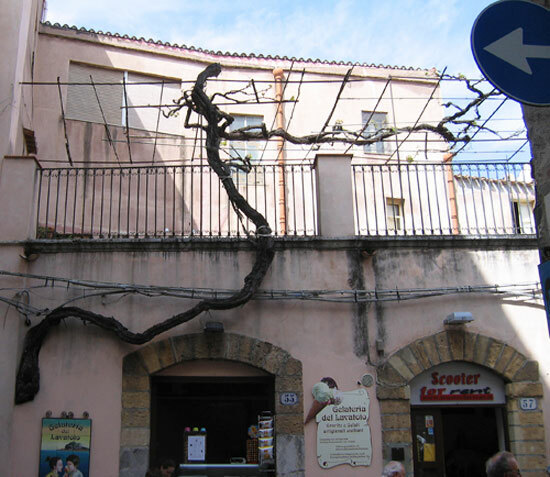 It can reach a height of 20 feet at which point it will probably have developed the thorns missing on younger plants. Benefits: Golden Dew Drop will attract butterflies and hummingbirds. Both are immune to its toxins. 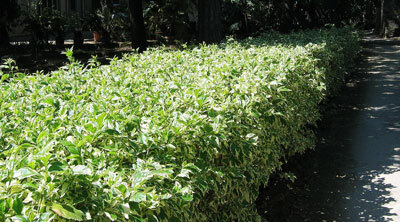 Planting and Care: For the best results plant this shrub in moist, fertile, well-drained soils in full sun. It is tolerant of a range of soil types and it will accept some shade though the flowers won't be as prolific. Warning: This plant is highly poisonous to humans and pets. Golden Dew Drop Duranta plumieri Jacq. This appealing shrub will grow to be about 10 feet tall at its best. Kept trimmed it will make a handsome hedge as you can see in the photograph below on the left. Benefits: According to a website I found, http://www.stuartxchange.org/Duranta.html, it has had several historic curative applications and presently studies have been undertaken to determine its benefits more scientifically. Planting and Care: Same as Golden Ear Drop above. 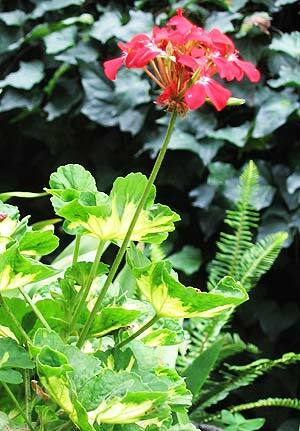 This 2 to 3 foot tall plant is a perennial blooming for a long period in Autumn. Benefits: Butterflies and hummingbirds like this plant as much as we do. 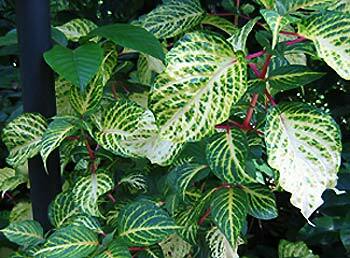 Planting and Care: This plant likes living in the shade and it prefers a moist fertile soil. 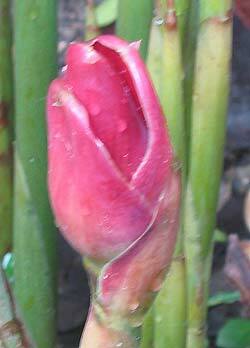 It is subtropical and can handle some, but not much, cold weather. Gold Fish, Guppy Plant Nematanthus sp. 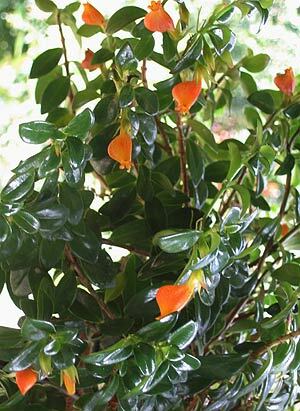 This is a very attractive plant with its deep green shiny leaves and its unusual salmony orange flowers that really do look like little fish. Benefits: Aside from its visual appeal it is nice to have as a butterfly and hummingbird attractant. Planting and Care: As you can see in the photograph, it will grow well as a hanging plant, though it is normally a ground cover in the open garden. Give it bright light or sun and a moderate amount of water to keep it happy. This is a colorful bush as you can see with deep green leaves veined with yellow verging on white growing on reddish/purple stems. And, it also flowers with bright yellow blossoms that are hummingbird attractants. That's a lot of bang for a bush! Benefits: This is a butterfly and hummingbird attractant. 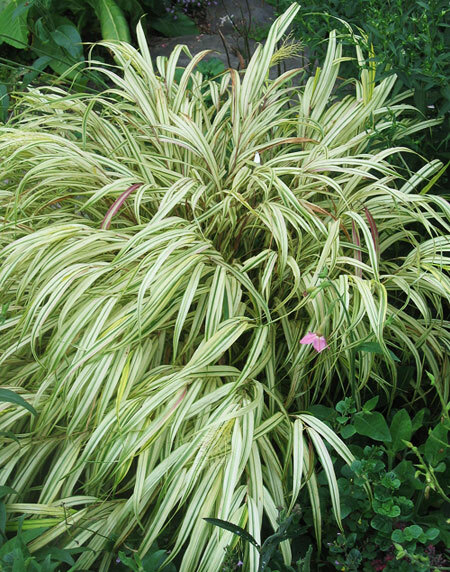 Studies seems to suggest the gold vein plant may have medicinal uses for a range of relatively serious diseases. From: Peru and Ecuador or Northern South America in general. Planting and Care: This plant is native to rainforest environments so do your best to duplicate that type of environment. Planted in full sun or in semi shade in a moist environment the gold vein plant will do its best reaching a height of from 6 to 8 feet or maybe more and spreading to as much as 6 feet. It is not frost hardy, but it is tolerant of the salt in a seaside environment. 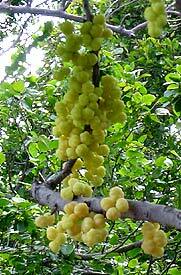 Growing to thirty feet or more given the moist soil it prefers, the gooseberry is a dense tree that seems visually busy in its appearance. 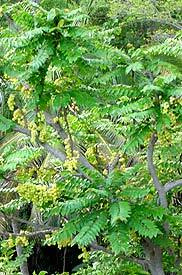 It has small leaves growing on soft extended stems, fruits that seem to arise from everywhere, and bark that varies from smooth to spiny. 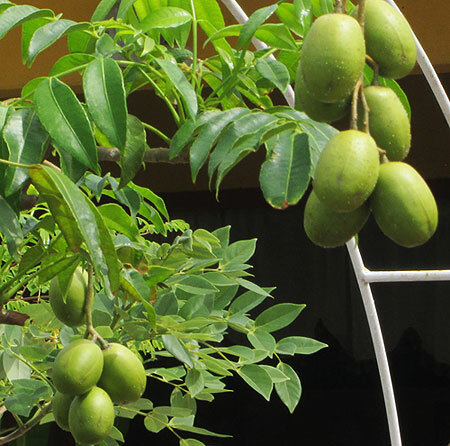 Benefits: In Montserrat the fruit is used to make wine. Its sour yellow fruits turn red when cooked in sugar water making a very nice drink. The tree is widespread around the world and many uses have been found for its fruits and for its leaves. It is also believed to have hefty medicinal qualities. 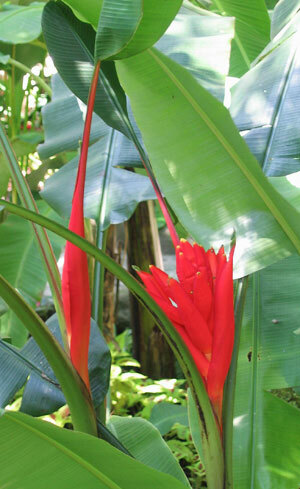 Photographed: Below our terrace garden at our former home in Montserrat. 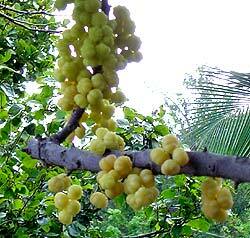 Planting and Care: The gooseberry likes moist tropical soil and lots of sun. It produces most of its fruits all at once during the winter months. Problems: In bad years, like 2007, this lovely tree was very vulnerable to caterpillars. They ate every leaf twice that year. We were advised to consider introducing a systemic insecticide, but chose to lose the tree before introducing yet more poison into the already very toxified environment on that small island. In the end it looked like the tree was going to survive without the poison so bravo for us. 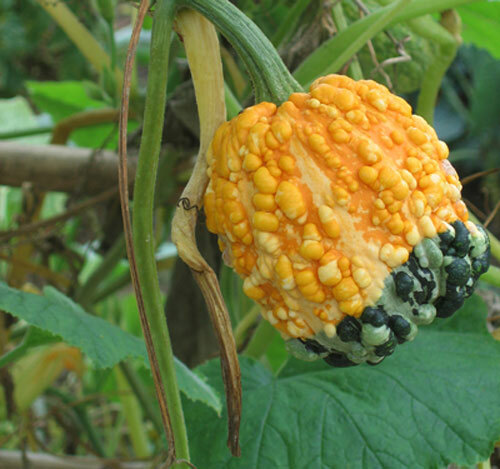 Benefits: These vining squash like fruits are dried and used as decorative pieces in many a home across the US. At one time in history they were used as storage vessels. Planting and Care: Think of this as a winter squash. Treat it just the same and it will flourish. I have the most fond memories from childhood of sitting beneath a concord grape arbor with my little friends. We would get up now and then to pick another bunch of grapes, then sit back down chatting amiably while sucking on these indelibly flavored grapes. Probably the best thing about them was that there was no garden care at that home, so the grapes were not doused in chemicals. At that time of year, my mother would take us out to the country somewhere to buy pounds and pounds of these grapes which she would turn into a year's supply of grape jam. We never had Welches®. Benefits: Grapes provide us with a wide variety of foods from wine to jams and jellies. What surprises me is the number and variety of curative properties these plants contribute to our well being. Photographed: On the left in the (Ortobotanico) Botanical Garden in Naples, Italy, in 2014. Photographs below have source information. 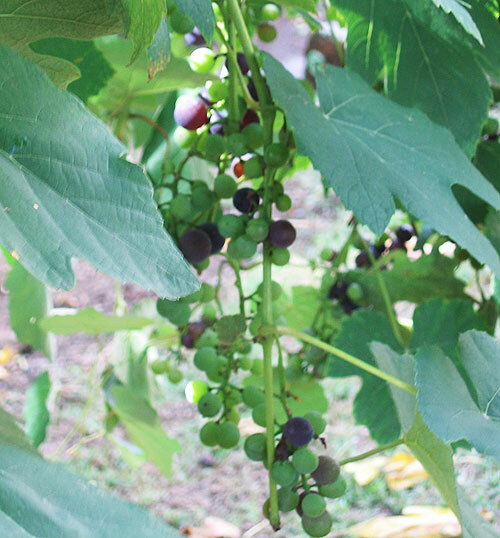 Planting and Care: There are so many varieties and uses for grapes it is best that you contact the agriculture department of your local college or university for information on the best grapes for the the use you intend and for your location. 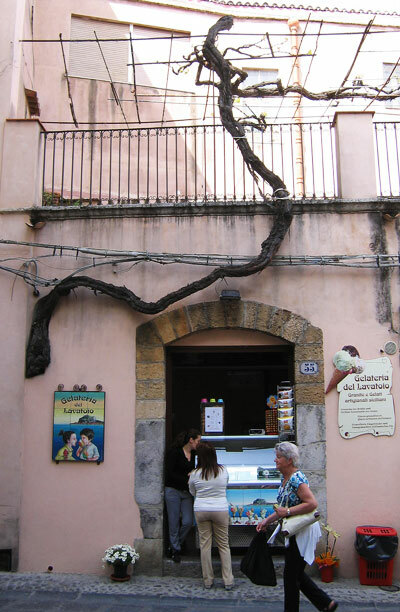 Photographed: In Cefalu, Sicily, Italy, in 2012. Photographed: On the southern coast of Sicily, Italy, in 2012. I loved the grape ivy I had growing in a hanging pot my apartment in New England many years ago. It was huge (2 feet wide and three feet long). Fortunately I had equally huge windows and this filled one of them. Grape ivy more resembles a grape vine. 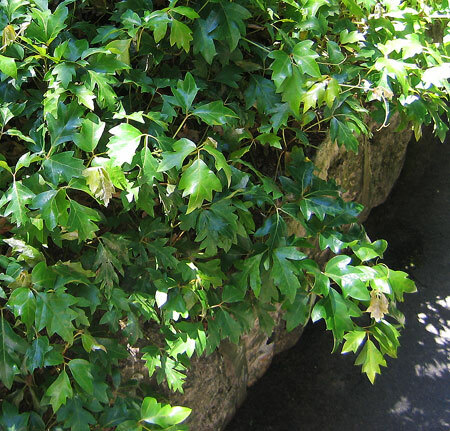 The ivy pictured in the photograph is an oakleaf ivy with leaves very much resembling oak leaves. Benefits: I didn't find anything other than its splendid greenery. 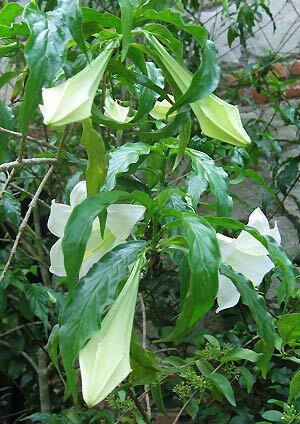 Planting and Care: This softer version of a vine loves to grow in a hanging basket in a bright area of the garden free of mid day and afternoon sun. It is an ordinary plant needing ordinary amounts of water. It is not frost hardy so it will have to find a place in the house if you're growing it in an area that is not frost free. 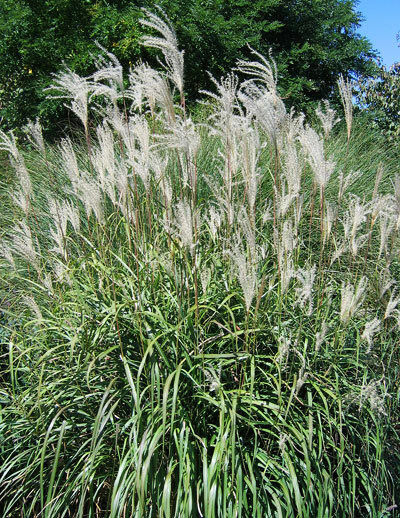 This is one of the smaller ornamental grasses, but no less appealing for its size. It is very adaptable in many areas of the garden because it doesn't dominate the scene, but blends well with its neighbors. 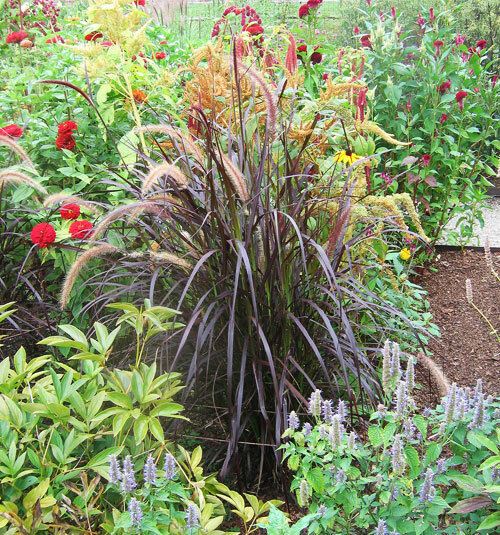 Benefits: Aside from being very pretty, desert plains fountain grass is deer resistant, a real plus in many places. Photographed: At the Roger Williams Park Botanical Center in Rhode Island in 2013 on the left and in 2014 on the right. 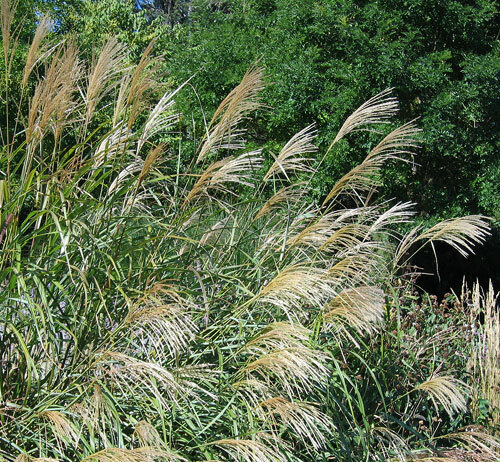 Planting and Care: This grass likes to grow in cooler climates in full sun and in warmer places in partial shade. Plant it in fertile well drained soil and make sure it has regular rainfall or watering. 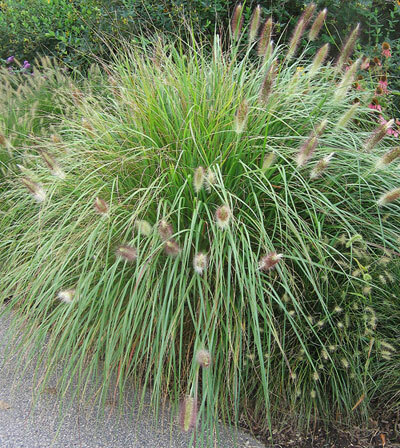 Desert Plains fountain grass is deer resistant. 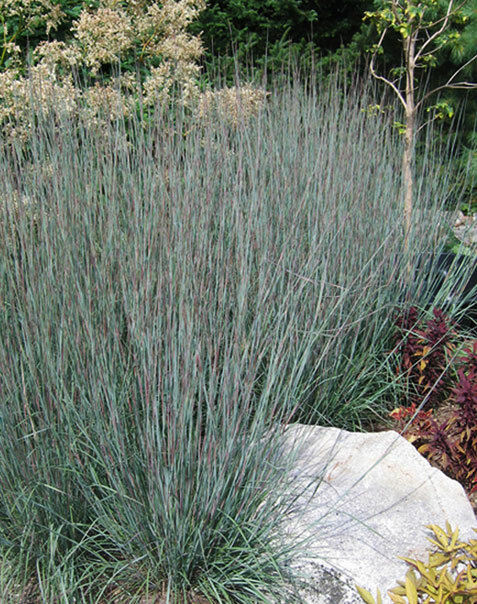 This delicate purple hued grass grows to be up to three feet tall with feathery fronds of seeds topping the foliage. We used this grass as a foundation cover for part of our home in Montserrat. It was perfect. It grew heartily in the full hot sun of the Caribbean and didn't ask for too much attention. I remember once a year cutting it down to about 6" as if mowing. That little care ranked it as one of the best plants in the garden. 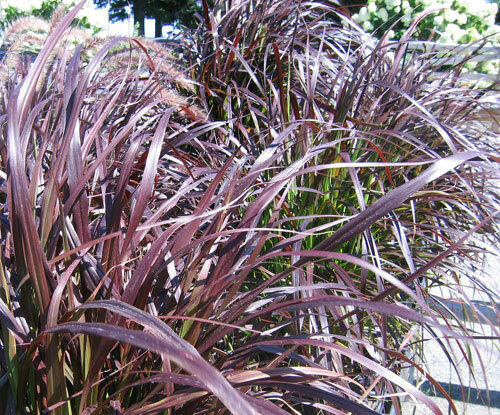 From: Originating in Africa and/or Afghanistan, fountain grass is now widely distributed in the world. Planting and Care: Its ability grow in just about any soil with good drainage and its ability to thrive in full sun on short water supplies makes this an ideal decorative grass. 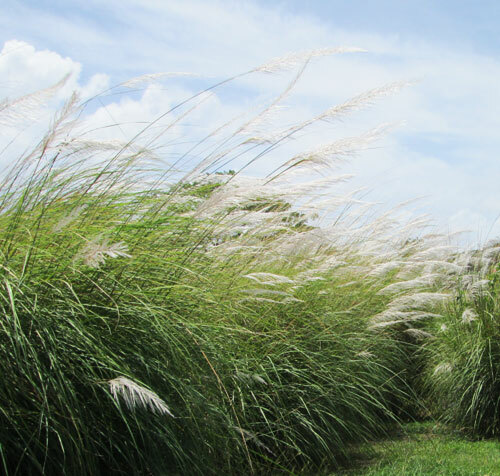 Landscaping ideas: Fountain grass makes a beautiful soft foundation cover for any home or small office building. It requires almost no care and thrives in terrible conditions -- full sun in tropical climates with low water requirements. Photographed: At a roadside plant nursery in Maine, 2013. 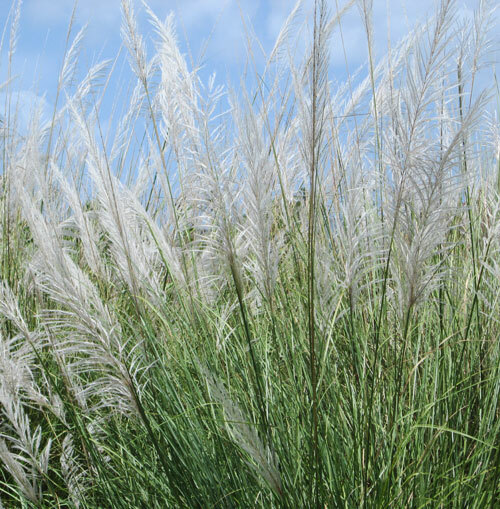 There are a few varieties of this grass, all delightful as you can see in the photographs. Benefits: This grass is deer resistant, a real plus in many places. Planting and Care: I think this grass in warm climates would prefer bright shade and in northern gardens morning sun. If you can give it some life as on a slope it will delight you even more. It likes a rich organic moist well draining soil. With my appreciation, this mystery grass was identified by Peter from Auckland, New Zealand. This beautiful perennial grass will please you greatly as a background for flowering annuals. It will grow to be at best 7 feet tall making almost a wall between your garden and whatever is behind it. Photographed: Golden Grove Tobago in 2018. 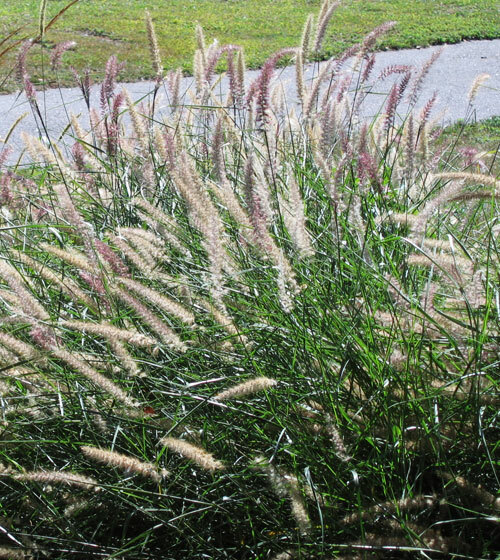 This is a lovely three foot tall perennial grass native to North America. Probably settlers heading west saw a lot of it on the way. I don't know if you can see it in the photograph on the right, but this grass has alternating lavender and blue green stems which are very pretty. One of the characteristics of this grass is its color changes as the seasons flow by. Benefits: Provides perfect habitat for some butterflies. Planting and Care: This is a survivor grass which does best in sunny places with well drained soil. I found this plant attractive in the same way that I find ornamental grasses appealing. It is relaxed, its coloring draws my eyes and I suspect it is easy to care for. 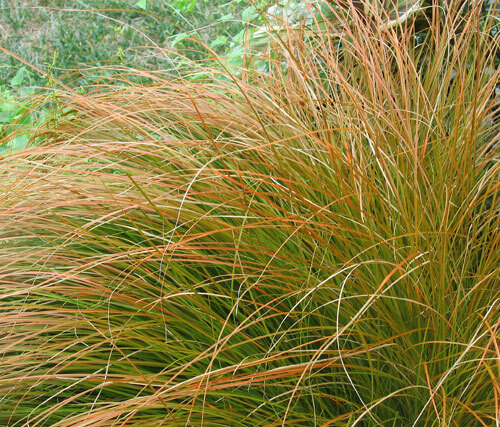 Planting and Care: Orange New Zealand sedge shows off its beautiful colors especially well when planted in full sun. It likes a mildly acidic or neutral moist rich soil. It is not considered winter hardy where soil actually freezes. Green tea is a light and easy to make cool summer drink or hot warming tea to speed away winter's cold. For cool tea take four tea bags and place them in a quart bottle of filtered water. Leave it on the kitchen shelf out of the sun for the day. In the evening, take out the bags and put the tea in the refrigerator. Hot green tea is the usual bag in a cup or loose leaves in a teapot with boiling water. Benefits: Teas, including green tea, may have benefits in fighting unhealthy bacteria in your digestive system which can't hurt. It is also recommended for folks with high blood pressure, but I found it to be just the opposite after a few days experimenting to see if it would help. Be sure to buy only organic green tea, as the commercial variety seems to be laced with quite a residue of pesticides. **Guava Tree Psidium guajava L.
Growing to between twenty and thirty feet tall, the guava gives us not only its delicious fruit, but many curatives as well. We had a lovely guava in our Taxco garden which required absolutely no care and annually gave us bushels of fruit. That was a tree after my own heart! In Montserrat, in an area called St. George's Hill, there are beautiful groves of guava trees. We were able to visit that area of the island a few years ago when it was not included in the volcano exclusion zone. From that visit until we sold our home and left the island, St. George's Hill was off limits for having been returned to the exclusion zone. 1. Its leaves and bark may be steeped as a tea to treat diarrhea. 2. Guavas are very high in vitamin C, much higher than oranges, and they are a good source of vitamin A and antioxidants. 3. To treat colds and inflammation of the legs, blend peeled guavas with orange juice and strain for a delicious and hopefully helpful drink. 4. 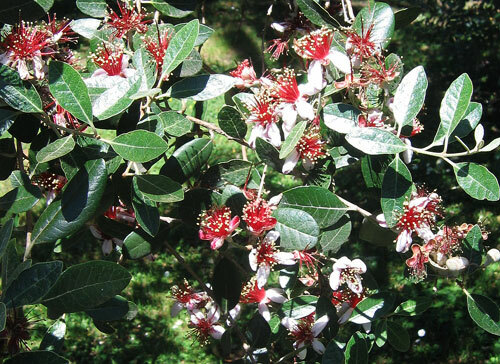 To treat itchy insect bites, crush guava leaves and apply to the bite. Planting and Care: This very pretty tree is known to be a heavy feeding fast grower, producing its wonderful fruit in its second or third year. The guava grows best in full sun in a warm and sheltered setting with a rich moist soil that is more alkaline than acidic (a pH of 5 to 7). It will also give its best if you provide a generous amount of organic fertilizer on a regular basis. In a special botanical garden like that in Naples, Italy, this small tree makes a person stop to admire and then examine. It is lovely when flowering from April through to June and of a size that makes it welcome in many smaller gardens. Surprisingly, deer do not fine this tree of any interest at all so you can plant it and watch herds of deer pass by without a speck of damage. Benefits: The fruit of this little tree is something special combining the flavors of pineapple and guava or pineapple and strawberry and the beautiful flowers are edible too. While deer do not recognize the yummy qualities of this tree, bees, butterflies, and birds do. From: The highlands of northern Argentina and adjoining countries. Planting and Care: Preferring slightly acidic soil, pineapple guavas are tolerant of soils and temperatures. We saw it growing in full sun in Naples. If you plan to grow one in a warm climate, make sure you give it afternoon shade from the hot sun. 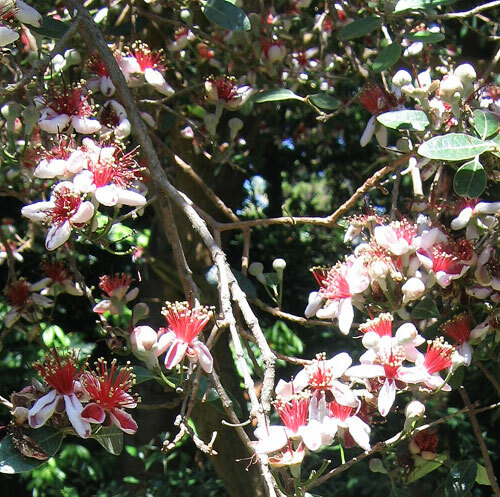 Pineapple guavas need watering to get off to a good start and you'll find the produce more beautiful flowers and more fruit if you do a deep watering weekly. With my appreciation, this mystery tree was identified by Peter from Auckland, New Zealand. This is a fast growing tree that can be very attractive, but it will need to have some control or your property will soon be overrun with them. It was called a gum until the last couple of decades when tourists to the Caribbean made toast of themselves on the beaches. Their red and peeling skin reminded locals of the gum tree hence its new name. 1. In Montserrat, gum tree bark is used as an antibiotic. Peel the bark and let it dry. Apply the dried bark to a wound and watch it heal. 2. Gum tree branches make great fence posts in the Caribbean where dead wood is so often attacked by termites. Simply stick a gum tree branch in the ground where you wish to have a fence post. Tie it to your fencing material, sit back and watch. Not only will you have a very secure fence post, you will have a tree! And the best news is that the gum tree is relatively unattractive to the plentiful and voracious Caribbean termites. 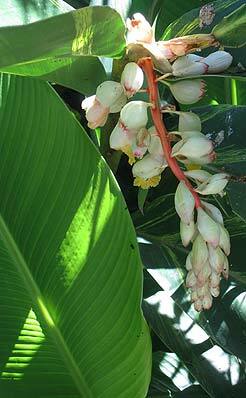 Planting and Growth: The gum will grow nicely in full sun or semi shade and it will handle dry conditions if it has to. The bark and trunk of the gum tree are very soft and easy to cut; unfortunately the roots are tenacious so be sure you want one before you plant it.